Sen. Kirsten Gillibrand (D., N.Y.) no longer opposes giving drivers' licenses to undocumented immigrants. "I think we have to make it possible for people to provide for their families," Gillibrand told the New York Daily News on Wednesday outside a diner in Brunswick, New York. "We need comprehensive immigration reform. Without doing that, you’re not going to get the problem solved for the rest of the country." Gillibrand formerly opposed then-New York Gov. Eliot Spitzer's controversial 2007 proposal to give drivers' licenses to undocumented immigrants. "I do not support giving driver's licenses to illegal immigrants," Gillibrand said in a 2007 statement, the Syracuse Post Star reported. At the time, Gillibrand said she supported legislation that required anyone seeking a drivers' license to show proof of citizenship first. Since she entered the spotlight as a potential presidential candidate, Gillibarnd has flip-flopped on a number of issues. She used to support gun control, and opposed amnesty as well as sanctuary cities. She has reversed her position on all of these issues. At at Wednesday press conference in Troy, New York, Gillibrand said her heart has guided her policy reversal decisions, giving the specific example of her reversal on gun control. "I would just tell them to look at my heart," Gillibrand said. "When I, now 10 years ago, became senator for New York, when I met parents who met their child to gun violence … the pain and the suffering that families are facing every day, I was convicted and said, ‘I have to fight for them, too.'" 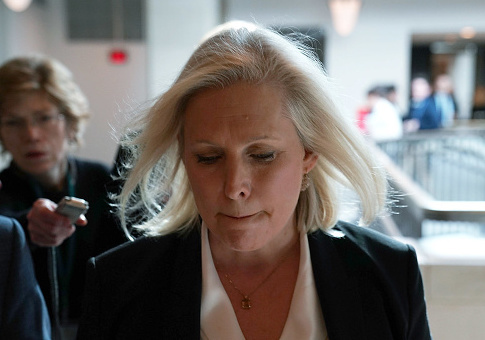 Gillibrand has also broken a promise she made during her 2018 Senate reelection campaign that, if elected, she would serve a full six-year term. This entry was posted in Politics and tagged 2020 Election, Kirsten Gillibrand, New York. Bookmark the permalink.